Platform Management Challenges: As more clients deploy multiple clouds, it becomes increasingly difficult to manage complex cloud environments that require self-service acquisition, consolidated invoicing, performance and security monitoring, configuration and security compliance, single-pane-of-glass ease of use, transparency, and a global view for authorized users. 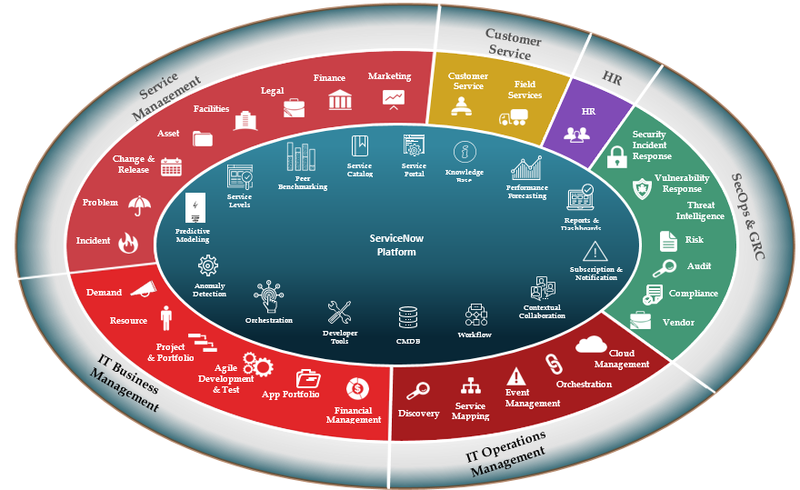 A&T Role: A&T is a ServiceNow MSP that can sell SN licenses and implement, configure, and provide O&M support. We can also totally manage services in a PaaS environment that will reduce the cost of operation. The figure below indicates SN capabilities from a role-based perspective.